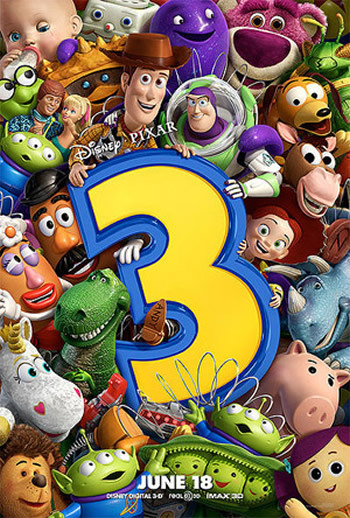 To sum up: In a summer reeking with mediocrity, Toy Story 3 arrives to save the day with a tale that is funny, exciting, clever, and above all moving, as Pixar continues it's creative brilliance with a wonderful send-off that is almost as good as the first two Toy Story films. Pixar's original Toy Story came out way back in 1995. It was a watershed moment that changed the course of animated entertainment; comparable to the original release of Walt Disney's Snow White and the Seven Dwarfs way, way back in 1937. And though, at the time of its release, we were all dazzled by the remarkable realistic quality of its computer animation; that alone is not what made the film so special. So classic. John Lassiter, now Disney's Chief Creative Officer, and his team were able to tap into something primal that was relatable to people of all ages. For us adults, it was that long buried, but never forgotten, joy of childhood, and the simple fun of playing with our toys. For the kids, it was a validation of what they already knew; that the toys were really alive. Whether Toy Story 3's creators knew it or not, there was far more riding on this picture than just about any other Pixar film. Unlike their other releases, Pixar established itself, and its standards of quality, on the original Toy Story. To visit it a second time was risky enough. If they tried for a hat trick and missed, it wouldn’t end Pixar or Disney, but it definitely could have left the impression that they were more interested in rehash profit taking, instead of the quality that we’ve come to expect and marvel at. A similar parallel would have been if Uncle Walt had revisited Snow White a second and third time. If you do it to Pinocchio, it’s not really a big deal. But do it with the film that essentially assured the life of feature length animation, that’s something else. The situation was similar with Toy Story 3. At the end of Toy Story 2, which came out in 1999, the two main characters Woody, the gangly, stuffed cowboy (voiced by Tom Hanks), and Buzz Lightyear, the high-tech plastic, outer-space action figure (voiced by Tim Allen) were contemplating their future and the time when their owner Andy would outgrow them. Buzz turned to Woody and asked, “You still worried?". Woody replied, “ About Andy? Nah, it will be fun while it lasts.”. And sitting there in the theater, I knew, then, that if there was another Toy Story adventure, the story would ultimately require that Buzz and Woody confront the inescapable day of being outgrown, and the exploration of the themes about uncertain futures and endings. At the time, the inevitability of their owner, Andy, outgrowing his toys was far in the future. But as any adult will tell you, time has a way of flying by quickly, and the dreaded moment has now come upon them, here in 2010. As in real life, the Toy Story universe has aged eleven years. Andy (again voiced by John Morris for a third time), the owner of Buzz and Woody, is now a young adult preparing to leave for college. Much has happened in that time, as Andy has, indeed, outgrown his toys. Many of his former toys are gone, fated to the inevitable garage sale, random donation, or, worst of all, the trash. Remaining are Andy's most prized, including the afore mentioned Buzz and Woody, but also Mr. and Mrs. Potato head (voiced by Don Rickles and Estelle Harris); the cowgirl, Jessie (Joan Cusack); Woody's horse, Bullseye; Rex, the Cowardly Lion of top predator dinosaur toys (Wallace Shawn); and of course Hamm the piggy bank (the indispensable John Ratzenberger). All of them now spend their existence shut up in a wooden chest, virtually forgotten, longing to be played with again. This is still the purpose of their existence, one they have been longingly missing since the maturing of Andy. And one by one, they've come to believe that it's time to move on. All save Woody, who insistently believes that they are still Andy's toys and that he still cares about them. But the truth is that if Andy reflects at all on his former childhood chums, it's probably only to regret that he didn't leave them in their original packaging (if he's a geek, that is). As the day of college approaches, the toys are fretting as to their ultimate fates. Woody, still the de facto leader of the group, tries to reassure them that they will not be thrown to the curb but will end up in storage in the attic, which “is a great thing!” But through many twists, turns, and misunderstandings, the toys end up donated to a preschool. In charge of the preschool toys is Lots o' Huggin' Bear (voiced by Ned Beatty), a purple furred stuffed bear who welcomes them with open arms. With him is the classic Barbie playmate Ken, who has never met Barbie, and welcomes her with open arms, thrilled to finally meet someone who understands his obsessive love for all of his fashion accessories. Ken, so high maintenance about his looks, is the ultimate metro-sexual doll (Yes, doll. Sorry, Ken. Girl's toy, you're a doll. Boy's toy, you're an action figure). With the exception of Woody, who still insists that they are Andy's toys, the rest are thrilled when Lotso assures them that they have reached a toy heaven, where they will all be played with and loved. But, will it be long before something turns amiss? Is the preschool paradise all it is claimed to be? Can there be drama without conflict? Suffice to say that very quickly, Woody, Buzz and the rest are plotting their escape from the preschool. In the past few reviews, I've spent some considerable time talking about the lack of emotional involvement, how the stories were predictable, and how the action scenes were unexciting. It's not enjoyable to put down your hard earned cash and have to sit through mediocrity, especially if it's in 3-D and movie prices are fast approaching the cost of a Broadway show. Once again, Pixar comes to the rescue, and produces a film that draws the viewer in on all three levels. As mentioned earlier, the original Toy Story was a visual marvel. But many years have passed, and since then we have basked in the majestic depths of the oceans of Finding Nemo and the infinite vastness of outer space in WALL-E. As a result, the Toy Story world is not going to engender the same awe as it once did. I'm not saying that there are no visual splendors, but they are mostly allocated to the enhancement of the environments that our characters find themselves in. This meant that the film would have to rely very strongly on the story and the relationships of the characters. Fortunately, this being a Pixar film, they manage it with seeming ease. Because the previous films were so good, this one has the advantage of the audience going in already invested in the characters. What Pixar does is capitalize on that, and with the quality their story, produce honest character arcs that Woody and the rest of the gang go through. Or in short, since the characters care, we care. And because we all care together, it is no idle thing to say that there isn't a dry eye in the house at the end of the film. The story is solid enough, producing enough twists and turns that it avoids the conventional. Sadly, while solid, the story is somewhat predictable, with the toys again getting stuck in the real world, their impetus being to return to the security of their home. But it is only predictable in its basic structure. There's enough uniqueness in the first half to make it interesting, even though we know where the story is going. But once the toys decide they need to escape from the preschool, the movie really comes alive. I've heard this section of the film referred to as a Great Escape inspired section. This is true only superficially. I found it to be closer to a prison escape than The Great Escape (for that see Chicken Run or the “A Streetcar Named Marge” episode of “The Simpson's”). Whatever comparisons you may wish to see, this is the most entertaining section of the film. It provides big laughs, from Mr. Potato Head using whatever's available so he can to get his various parts around, to Buzz undergoing a major personality change from being reprogrammed. Unlike most of the films that I've seen recently, it provides genuine thrills as our heroes find themselves in one form of peril after another, with the levels of tension and excitement crafted in such a way that you'll feel it with them. I still have my wife's fingernail marks in my arm. And it was actually during this section of the film, when all looked lost for our heroes, and they did something in that hopelessness, that made me feel more emotional than even the end of the film. Tom Hanks continues to produce that common sense earnestness that makes Woody the solid moral center of the films. Tim Allen's Buzz Lightyear still exudes the self-assured ego of the greatest of heroes, tempered with the knowledge that he's a valued toy. And then there's John Ratzenberger's Hamm, with his casual intellectualism and ability to throw out the most hilariously obscure quips, he's still my favorite of the Toy Story characters. All of the actors return to their roles without missing a beat. It feels like no time has passed, and more importantly, they don’t sound as if they have aged vocally (which, after ten years, is bound to happen). They also carry the same enthusiasm in their performances that was evident in the previous two outings. It’s clear that the actors love these characters and want to ensure that they are presented in the best light. No wonder they keep returning to voice them. I don’t know how Pixar does it, but it’s clear that they are the best thing to happen to Disney in the longest time. It’s a pretty safe bet that without Pixar, Disney would, sadly, be a shadow of itself. I don’t know what special gift he has, but it seems pretty clear that John Lassiter is spending a lot of time in the Haunted Mansion and having Madame Leota channel Walt through that crystal ball of hers. Toy Story 3 is a brilliant culmination for the series. It’s almost as good as the other two films, marred only by the slight predictability that inevitably creeps in. To return to this world a fourth time would be a great mistake. The narrative arcs and themes that have been introduced have been explored to their logical conclusion and I really don’t see how they could recapture the magic when there really isn’t anything left to say. But, with Pixar, I will never say never.